Immigration was one of several issues that figured prominently in Obama’s State of the Union address in February. A Pew Research Center survey conducted shortly after the speech tested several of those issues and found that 51% of Americans deemed action on major immigration legislation to be “essential” this year. About equal numbers of Democrats, Republicans and independents agreed. Just under four-in-ten (37%) said action on immigration was something that could be done in the “next few years” and 7% said it should not be done at all. A more recent McClatchy/Marist Poll survey, conducted in July, produced a similar result to the Pew research survey on the need for action this year. 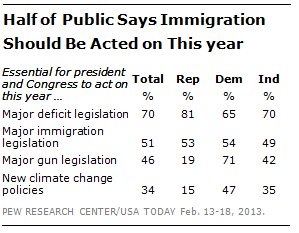 The public’s urgency of enacting new immigration legislation was far less than that for addressing the federal deficit. Seven-in-ten said action on the deficit was essential this year. On two other issues raised by Obama in his State of the Union, 46% said passage of major gun legislation was essential this year and 34% said the same about new climate change policies. Immigration has not ranked among the highest priorities among Americans, according to polls conducted by two news organizations since summer. In a CNN/ORC survey in September, 3% named immigration as the most important issue facing the country today, far behind the economy (41%), health care (16%), Syria (15%) and the deficit (13%). A CBS News poll conducted in July asked those surveyed to name the most important thing for Congress “to concentrate on right now.” Again, immigration at 8% was low on the list. Four-in-ten named the economy, 16% cited the deficit, 15% said it was health care and 12% named education.